Greenpeace has started a campaign against Kimberly-Clark, the company behind such brands as Kleenex, Scott, Viva, Cottonelle, and more. 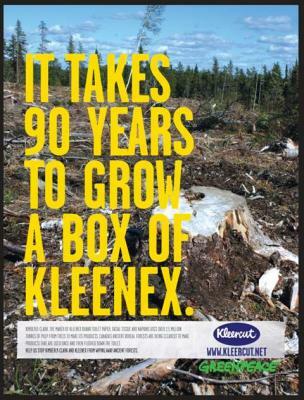 Kimberly-Clark uses 100% virgin fiber for its Kleenex products and even boasts about it on their website. Because it's better for "softness." But their oh-so soft products come from unsustainably managed forests, predominantly logged by clearcutting. What? A Kleenex boycott during allergy season, and nary a post about Job's "Greener Apple" announcement? Well, I read Jobs' announcement with interest, but as many other people have noted elsewhere in the blogosphere, I'd rather see an announcement about what they've done, rather than what they are going to do. I'm adopting a wait and see attitude. I'm happy they've apparently felt the public pressure and are apparently willing to do something about it, but I want to see results before I dish out my congratulations. Here's Apple's press release, for anyone who wants to read it. Just FYI, a lot of the things mentioned as "completed" are pretty trivial and/or are basically the same as the rest of the industry. What Apple was being criticized for is not being a leader in the realm of sustainable product design, as they arguably are in product design and development (not to mention marketing, etc.). What fact do I have wrong? That Kleenex is made from virgin forests?